DeMarini’s CF Black is a limited edition USSSA version of the 2019 DeMarini CF Zen in baseball. The bat is exactly the same in its performance construction, but made in a unique CF Black colorway that has us drooling. We are huge fans of the CF line of bats. This addition, much like the Zero Dark lin… Jump to the full review. We aren’t the only ones to have information about the CF Black. Other places, in particular those who sell bats, usually have a boiler plate write up on the specs of a bat. Many of those we reference to make sure we are seeing what we should be. Here are some more references for the 2019 DeMarini CF Black review. The bat is exactly the same in its performance construction, but made in a unique CF Black colorway that has us drooling. We are huge fans of the CF line of bats. This addition, much like the Zero Dark line of CF bats before it, is sure to fetch a premium in the secondary market. Performance is exactly like the 2019 version of the CF Zen because it is, after all, the same exact bat. Note, though, it only comes in a USSSA drop 5, 8 and 10. The CF Black is the same bat as the CF Zen for 2019. As such, the USSSA recommendations stay that same. That is, a hitter looking for what many believe (including us) to be the best USSSA bat on the market. The Black version adds some flair and unique style but, in the end, is a ball killer just like the CF Zen. The fact the bat prices out the same, at least off the shelf, as the CF Zen makes it highly recommendable. We love the smooth smash, big barrel and balance swing weight of the 2019 DeMarini CF Black. It is nearly impossible to ring your hands and every smash feels like a bomb. Exit speeds are top shelf and the barrel size for a two piece composite is about as good as it gets. There is a reason these are the most popular USSSA bats. See our full 2019 CF Zen review to check out the comparison to the 2018 CF Zen. DeMarini's CF line of baseball bats are, arguably, the most popular bats on the planet. We have hit, and reviewed, every CF series since the CF3. We have now spent at least 30 hours with the 2017 CF Zen in the hands of several different players at elite levels of baseball. We've spent 22 hours in total using and researching DeMarini's 2016 CF8 baseball line specifically, and countless hours swinging everything else. Built on their long line of success within the CF family, the DeMarini CF7 baseball bat comes with one of the the lightest swing on the planet. There are a few two piece composite bats with a light swing in the big barrel/USSSA market. To name a few, Rawlings’ Quatro, Slugger’s 919 prime and Easton’s Ghost X Evo. The only company to come out with a limited edition version of these bats throughout the year is Easton. In 2018 they had a color up version (white) of the drop 5 USSSA. That white version bat did very well for them. 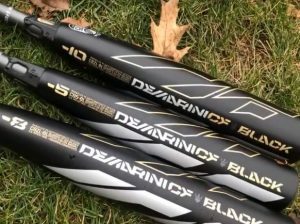 A few years back DeMarini created some Zero Dark versions of the CF Zen. These were limited edition bats only to be found in brick and mortar stores. These CF Black’s are similar to that in the sense of a later release/color up that will reinvigorate the CF Zen lovers among us. DeMarini’s CF line of baseball bats are, arguably, the most popular bats on the planet. We have hit, and reviewed, every CF series since the CF3. The CF Black is a two piece composite bat with a big barrel, great connection piece and light swing. It is the exact same bat as the 2019 CF Zen but with a new color design and slightly new name. The CF Black, for now, only comes in a USSSA version of a drop 5, 8 and 10. No word if it is coming in a USA version or BBCOR. But, don’t hold your breath.